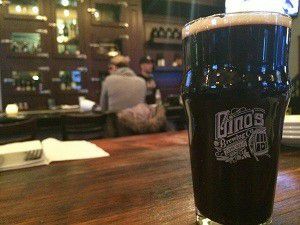 Gino’s East Brewery has a new seasonal beer on tap just in time for St. Patrick’s Day! This year Chicago will celebrate the holiday on March 14. Our Brewery, located at 500 N. LaSalle, is two blocks from the Chicago River, which is famously dyed green every year. We’ll be serving up this Irish-inspired brew through St. Patty’s, so get it while it’s still here. A popular tourist destination in Ireland (more hotels than any other city in the country! ), Killarney is home to famous landmarks including Ross Castle, Muckross House and Abbey and Killarney National Park. Known as a “walking town”, Killarney is a great place to explore on foot. Since we won’t be traveling through Ireland this St. Patrick’s Day, the next best thing is our new seasonal. Killarney Connection, Our Foreign Extra Stout, is named after the town of Killarney. Brewmaster Kevin Patrick McMahon, who’s family’s lineage traces back to Killarney, chose to honor his Irish heritage with this full bodied stout. Roasted Barley, Chocolate, and Black malts offer it’s obsidian color while also attributing a roasty espresso and dark chocolaty sweetness to the nose. With a creamy tan head, and balanced finish, this wonderfully drinkable stout will help you get your Irish on for St Patty’s day, and endure the last stretch of winter weeks ahead. Our taste buds are ready to try this bold beer! We’ll see all of you from now until St. Patrick’s Day!